The assembly of a Drill or Lathe where, during rotation, the Bit or material is held. A Chuck has movable jaws, for gripping Bit. 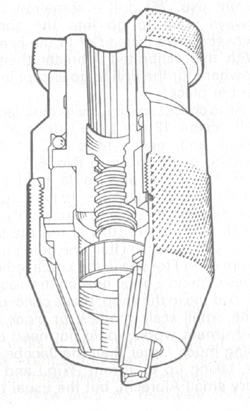 A Collet is a split-sleeve type of chuck -- but no movable jaws-- for holding drills and other such tools. Similar to a Drill's Chuck or Shaper's Spindle, an assembly on a Router where the Bit is inserted and gripped tightly. Uses a compressio sleeve, or split-sleeve, to grip the Bit's Shank. The greater number of splits, also known as slits, the more efficiently the collet grips the Shank of a router's bit. See [Anonymous], "Router Collets", Woodworking Magazine, Autumn, 2006, back cover, for info on a how a collet works, types of collets, and maintenance. 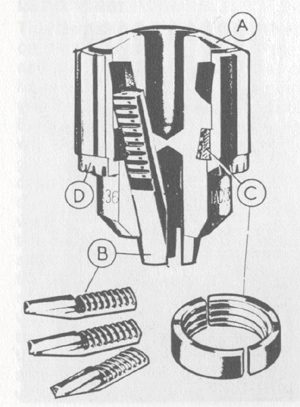 On the left, the anatomy of an Albrecht keyless chuck. "The design enables even large drills to be gripped firmly when hand-tightened". Ordinarily, a Collet chuck is made to hold only one size of tool shank without the addition of an adapter. Source: Home Craftsman 4 March-April 1935, page 172. It is no use having a perfectly formed drill point if the drill itself is not held both firmly and true. Source: Tubal Cain. Drill, Taps and Dies.Birmingham, England: Argus Books, 1976, page 38. Sources :Home Craftsman 4 March-April 1935; Tubal Cain. Drill, Taps and Dies Birmingham, England: Argus Books, 1976. By way of annotation on this book, I must say that it is one of the best books that I have ever purchased on an impulse at a used book store. It is 30 years old, is written in England -- which does not mean it''s "bad", simply that frequently books written in another country do not necessarily speak to your needs, because the products discussed are different, etc.